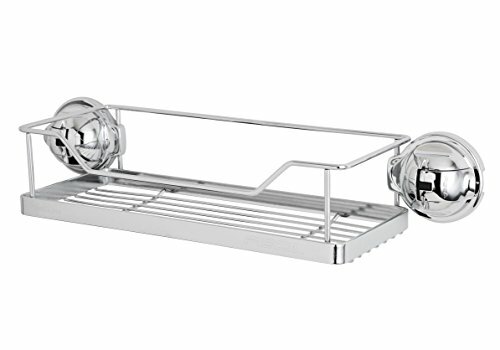 Premium stainless steel provides an elegant storage shelf wherever it's most desired in the kitchen or bath. Drains liquid to prevent water damage to contents. Removable and adjustable, allowing versatility in angling and surface mounting. Perfect to use inside kitchen sink or shower stall for extra storage. Securely supports up to 17 pounds. Suitable for nonporous surfaces only such as glass, mirror, polish stainless steel/metal, plastic board, finish marble, polished tiles, etc. For tight vacuum seal. Non-suitable surface material: porous surfaces such as dry wall, concrete, wallpaper, wood, imitation brick tile, painted wood surface without high gloss coating, etc.